So, what's it about? The housing market collapse of 2008. I know- a movie about the housing market collapse sounds about as appealing as paint drying, but it's actually not. 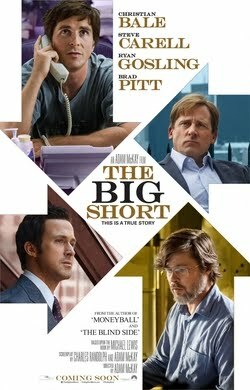 It's massively entertaining, because the movie looks at three separate storylines- the first is about a somewhat eccentric hedge fund manager, Michael Burry (Christian Bale) who discovers all the way back in 2005 that the housing market is extremely unstable thanks to high-risk sub prime loans. He decides to create a credit default swap market which would allow him to essentially bet against, or 'short' the housing market. Everyone thinks he's crazy. A salesman/banker type by the name of Jared Vennett (Ryan Gosling) (storyline #2) discovers Burry's analysis and gets in on the action- not before an accidental phone call gets Mark Baum (Steve Carrell) and his team in on the game as well. He sends his team down to Miami, where they discover that it's true. Mortgage brokers are making money selling risky mortgages and helping to create a housing bubble. The third storyline involves a pair of young investors who discover a prospectus by Vennett and want to get in on the action, but they have to convince a retired securities trader by the name of Ben Rickert (Brad Pitt) to help them out. Eventually, the bets that all three 'storylines' make come due and the housing market collapses- but not before they all realize that there is a staggering level of fraud throughout the system. Baum and Company discover that the credit rating agencies are riddled with conflicts of interest. The young investors and Brad Pitt realize that the SEC has no regulations to monitor mortgage backed security activities. And with pressure from his investors mounting, Burry discovers that banks collude with the major bond-rating companies to maintain their ratings on useless mortgages which allows them to dump the bad mortgages before their true value becomes known. Eventually it all goes to hell, of course and everyone involved in our story makes a filthy amount of money- but not everyone is all that happy about it, given the cost to the every day people affected by it and the staggering lack of accountability for any of the banks and companies involved in the scandal. Overall, this was a surprisingly entertaining movie about subject matter that normally would put me in a coma. To be totally honest, I want to track down and read the book to see if it's as informative and entertaining as the movie is. McKay, I think, knew his subject matter was somewhat, well, obscure- or hard to connect with, because Ryan Gosling's character serves as something of a narrator for the film and there are cut-away scenes featuring Margot Robie, Anthony Bourdain and Richard Thaler and Selena Gomez all playing themselves, all explaining some aspect or another of the looming economic crisis facing the characters. It's quirky and if done wrong, it could have seemed jarring, but McKay makes it work beautifully.